entire squares had been burned down, the City is desolate, scarcely a citizen is seen in the street. Our troops began to pillage the city. Everything is in confusion. Blair's division has been ordered into the city as provost guard. My company was the first to enter the rebel fortifications. This victory is rather an inglorious one. But I hope it is [best so?]. Our regiment moved to another camp, farther to the left of our old camp, it was late as we returned from duty, so we remained in our old camp. It rained a little this evening. Saturday 18. I moved my company to our regiment. Went out to destroy the R.R. 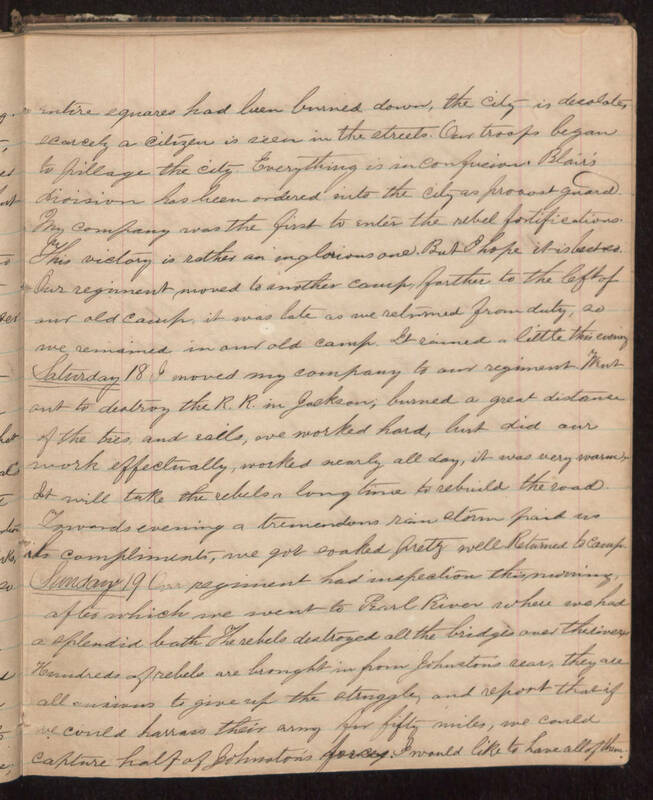 in Jackson; burned a great distance of the ties and rails, we worked hard, but did our work effectually, worked nearly all day, it was very warm. It will take the rebels a long time to rebuild the road. Toward evening a tremendous rain storm paid us its compliments, we got soaked pretty well. Returned to Camp. Sunday 19 Our regiment had inspection this morning, after which we went to Pearl River where we had a splendid bath. The rebels destroyed all the bridges over the river. Hundreds of rebels are brought in from Johnston's rear, they are all anxious to give up the struggle, and report that if we could harass their army for fifty miles, we could capture half of Johnston's forces. I would like to have all of them.